As written in the Ithaca daily journal September 20th 1875 The manufacture of calendar clocks has grown, during the past 10 years to be one of the largest and most profitable of the industries of Ithaca. From a small business employing half a dozen hands and less than a thousand dollars in capital, it has developed to such proportions that there is work enough for half a hundred men and many thousands of dollars are invested. Since the manufacture of these clocks has become of such importance here, an outline of their history may be of interest. It is worthy of remark that all the calendar inventions which are of any value, with one exception have had their origin and been perfected in Ithaca, NY. What is perhaps equally noteworthy, none of the inventors were clock-makers, or had ever worked in the clock business. The first machine to keep a calendar carried by the clock was the invention of j.W. Hawes, esq., of Ithaca, and was patented in 1853. This machine would not of its own mechanism show the 29th of February, in leap year, and soon found its place on the shelf. Soon after, mr. Wm. H. Atkins invented a calendar which was automatic in its operations, adjusting itself and showing all changes, including the 29th of February. A patent was issued to Atkins and Joseph c. Burritt for their improvement, on the 19th of September, 1854. These gentlemen disposed of their patent in 1854 and 1855 to messrs. Huntington and platte, who obtained another patent on the same machine in 1857. The atkin machine was placed in the hands of james e. And eugene mix for manufacture and improvement, and they gave it shape for practical use. Improvements made by the mix brothers were patented in 1862. These later gentlemen subsequently sold to the seth thomas clock company, of plymouth hollow, conn., their patents on the calendar and improvements. In the winter of 1864-65, mr henry b. Horton, of ithaca, invented a new and more perfect machine to keep the calendar, and in april, 1865, obtained his first patent of eight claims. Mr horton knew that his inventions were valuable , and expecting to make his fortune by their sale, like many other inventors, he went to the land of yankee clocks-connecticut. But alas for his expectations ,he first went to the seth thomas clock company thinking they would grasp his patents and thus prevent opposition. Looking them over they said: “no, they will never injure us , or be heard of again.” not entirely discouraged, mr. Horton then applied to the waterbury clock company. After a long consultation, the proprietors concluded to offer him $300.00 for his calendar, if he would guarantee that there were no infringements upon it. Quite discouraged in his attempts to sell this darling product of his brain, mr. Horton returned home, and determined to undertake manufacture of calendar clocks. In august, 1865, he associated with himself, for this purpose, mr. Charles d. Johnson, mr. Harvey platts, and mr. John h. Selkreg, and the firm assumed the title “ithaca calendar clock company.” each of the four partners invested $200.00, and with a capital of $800.00, they rented the second and third stories of the mack building(where crozer & feely’s grocery now is) and begun the manufacture of ithaca calendar clocks. They would probably not have gone into the business if they had foreseen the expense and labor subsequently required to make a perfect clock. But mr. Horton’s genius was ready for any emergency. He invented an iron case for the clocks, which was cast at little expense at j. S. Reynold’s foundry. These cases were easily put together and obviated all the labor that is now put upon the beautiful and elaborate wooden cases. Ordinary clock movements were used, and so all the company had to do was to manufacture the calendar movements and put the works in the cases. Some of these iron case clocks were sent over to england, and the english , who had heard of our iron clad gunboats, dubbed them the “iron clad clocks.” The manufactory remained in the building at the corner of state and cayuga streets until april, 1866, when the company purchased and moved into the building a few doors south on cayuga street, now occupied by anderson’s liquor store. Here they first used power. In about a month after going into the new place, a stock company was formed with a capital of $100,000.00. Together with the gentlemen who first engaged in the business, mr. Wm. J. Storms, mr. M. L. Wood and mr. S. P. Sherwood took stock in the manufacture. The company was organized by appointing j. H. Selkreg, president; wm. J. Storms, secretary and treasurer, and h.B. Horton, superintendent. Messrs. Storms and horton still retain their positions; j.H. Selkreg retired from the presidency less than two years since, and was succeeded by b. G. Jayne. In august, 1866, mr. Horton obtained a new patent for improvements upon the calendar with nine claims, which with the eight claims previously recorded make seventeen claims upon the calendar of these clocks alone. It was early discovered that some means must be devised to toughly test each calendar, and ascertain its reliability and the certainty with which all the changes would be made by it. Mr horton, assisted by mr. Wood invented and set up a testing machine upon which every clock is placed before being offered for sale, and the time movement being detached, the calendar is run through the entire changes of different length months for eight years thus covering two bis-sextile or leap years. If these changes were correctly indicated the calendar movement was considered safe to present the clock to the public. New machinery was added to the manufactory from time to time, and the business grew to such proportions and promised so favorably that the company had to look for larger quarters. 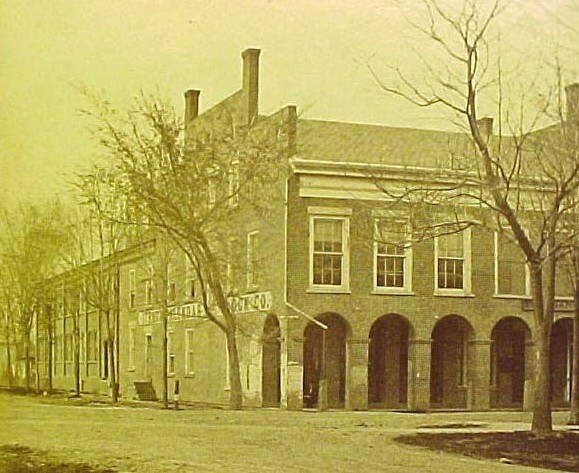 In 1867 they leased the west half of a building located at state and albany streets. Mr. Williams (landlord) erected a large workroom at the rear of the building and also a fireproof room to house the 30 horsepower engine. The new space was moved into in november 1867, and became know as the calendar clock works. At this location the business prospered amazingly and the agents of the company were sent throughout the country. The old iron cases were discontinued and the wooden cased clocks were becoming known of being the best of the calendar kind being manufactured. Mr. Storms was entrusted with most of the management of the company and the company grew quite remarkably during this time. From time to time there were changes in membership, some retiring and others coming in, but no radical changes took place until the winter of 1873-74, when mr. B. G. Jayne bought the stock of several members and $50,000.00 was added to the capital of the company. This change contemplated the erection of a large building and greatly increasing the manufacture. Mr. Jayne purchased the old fair grounds and after laying it out in lots and streets, assigned to the clock company a suitable lot 200ft. X 325ft., bounded by auburn, adams and dey streets. The preparation for their building was begun early in the season of 1874 and in less than one year was completed, and moved into in june of that year. The visitor enters the building through the secretary’s office, which is in the southeast corner. Here, of course mr. Storms is the presiding genius. He is generally found sitting or standing behind a high desk of many drawers and cubby holes, posting books or dashing off correspondence to all quarters of the globe. It is astonishing, the number of letters that go through the post office from their works in the course of a year. This main office is provided with a large and convenient safe, desk, a wardrobe, and also a telegraphic instrument, which is connected with the lines of the ithaca telegraph company. Adjoining the office is a smaller room, used as a private office and sample room. Right here we may as well say that the building is plumbed throughout for steam by which it will be heated. Speaking tubes extend from the office to the various departments on each of the three floors. From the office we go into the packing and shipping room, first floor south end. Here clocks are all the while being packed in neat boxes, and shipped to all points. In the west end, the testing machine is in operation. It has a capacity for testing, as described above, 54 clocks at a time, and two lines, or 108 clocks are put through each day. A stock of at least 1,000 clocks are kept on hand at all times. An elevator worked by steam, connects this room with the stories above. In the west wing is the machine department. All the machinery for the calendars is here put together, and much of it manufactured. Turning, punching and drilling machines are always busy. Fifteen to twenty of the minutest holes are drilled in the calendar frame alone. A turning lathe for repairing the other machinery is among the useful articles in this department. Passing through a door at the northeast, we enter the engine room. Here for the triple purpose of supplying power, heating the building and drying the lumber. The company has a 35 horsepower engine and two 35 horsepower boilers which are located on the outside of the building encased in bricks. The steam, after performing it’s duty of heating the building , it passes into other pipes where a large portion of it is condensed and discharged into the large underground reservoir in the quadrangle. This reservoir also receives the water from the roof of the building, and thus the works are to be supplied at all times with pure soft water, which is of great value for steam purposes. All the shafting in the building is fitted with an improved pattern of coupling, from which there is no danger to the workmen. It is also supplied with self adjusting oil hangars which do the oiling while the shafting runs at a velocity of from 250 to 600 revolutions per minute. We are informed that it will no require oiling or attention oftener than once a year. But to return to the power which moves the shafting. The engine is a very beautiful and simple one. There are some novelties in its construction, among which is a hollow foundation in which the heator is placed, thereby getting it out of the way and away from frost. The engine was manufactured by williams brothers, under direction of their forman, mr. Durphey, who designed it, and who also supervised its setting up and installation. Next we pass into the rough lumber department in the east wing. The machinery here consist of a planner,saws, ect. About the neatest thing we have seen recently, is the blower for carrying all sawdust and shavings from these rooms to a tight room to be used as fuel. For the convenience of the workmen in this department, a railroad track for handcars, extended to the lumber sheds in the rear of the building. In this same floor and wing is the box –making department. Here,in one corner, a man is constantly engaged in making the imitation ebony ornaments for the parlor clocks. The material is a composition of glue,sawdust, whiting and lampblack . It is moulded into handsome little brackets and when dried and polished is as hard and shining as the genuine ebony. A stairway leads to the second story, wherewe find ourselves in the case making department. A considerable portion of this veryparticular and handsome work is done by hand, but much is done by machines. Among the machines found here is a shaping machine, a tenon machine, matching machine, moulding machine, turning lathe, two planers, and ect. Over the engine room, there are two dry kills for lumber, ect. On the corresponding floor in the west wing is the calendar department where all those little brass, steel and copperwires are filed out, fitted and put togeather. A smallroom is done off for a tumbling machine, in which certain little castings are rolled around in sawdust untill smoothed and polished. The acids used in the works are kept in this room. In the south end on this floor is the clock department. The clocks are put togeather and as fast as they are finished they are placed on shelves here, and set to running. A record of the time of each is kept on a little slate and if it runs too fast or slow it is regulated, accordingly. Some novel machines in the room are a glass cutting machine and a dial punching machine. Immediately over this room, on the third floor, we find the finishing, polishing and varnishing department. The rosewood cases have a hard finish which requires six week to dry. The walnut cases are finished with a french polish. In the east wing, on this story, is a continuation of the case department, and the west wing is used for a storeroom for cases. Every precaution is taken against fire. In the upper story there are large water tanks which furnish water for hydrants on each story; a hose is kept ready to be attached to these hydrants and pails of water are standing at several points. In this year of 1875 there were about sixty hands employed in the turning out of 30 clocks a day. It was estimated that with a few more men and the same machinery , 50 clocks could be turned out in a day. The factory had ample space to house both men and machinery to turn out 100 a day. In spite of precautions taken against fires, the new building was reduced to ashes by a fire that took place on february 12, 1876. The newspaper reported that the town hall bell roused the entire town at 4:20 a.M. Considering the condition of the streets, the fire teams dragged the apparatus to the sene of the fire in good time, but failed to return with enough coal for the engines to produce the required pressure for the hoses. The engines were fed with wood, which failed to produce the required pressure. The night watchman claimed there was no signs of fire when he made his rounds. In some mysterious fashion the blaze startedin the wood department and was not discovered until the interior of this department was all ablaze. The flames broke through supposedly fireproof partitions and walls and in many placesthe walls fell with the collapse of the roof. It is said that the lightof the fire illuminated the entire valley and could be seen almost 40 miles away. A large number of clocks ready for shipment were gotten out safely, but about 4,000 clock cases in the upper stories of the building were burned and many workman’s tools were destroyed. 60 men were thrown out of work by this fire and the loss was estimated at about $40,000.00. The building alone cost $20,000.00, but the foundations being intact and a large number of bricks salvalged, it was found that rthe building could be restored for about half the original cost. Fortunately the contents were insured for about $30,000.00. The company immediatley began plans to rebuild the structure, and the building still stands today. The company continued in business and flourished until the early 1900’s When the company lost it’s best customer. The company had been selling almost its entire production to food manufacturers, cigar makers, chewing gum manufacturers, wrigley being one and to brewers and distillers. The latter was being legislated out of business by the volstead act. It is also said that the need for calendar clocks were on their way out because they cost at least 3 times the cost of a time only clock and many business’s were giving out paper calendars for free with thier own advertisement on them The company went out of business in 1918. 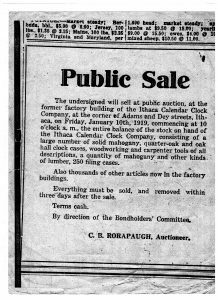 There was an auction held at the factory on january 10th , 1919 and the entire balance of cases, clocks and tools were sold. Durring the course of business the company produced over 40 different models and also made quite a few custom clocks. In 1882 14 special clocks were made for the state capitol at albany n.Y. Over the years the ithaca calendar clocks have become a very collectable item. The prices of the clocks took off in the late 1970’s and early 80’s. Many of the clocks that a few years earlier were selling for $100.00 and less were all of a sudden selling upwards of a $1,000.00 and more. In the early 80’s many ithaca’s were being stolen in the ithaca area to such an extent that many people started to put their clocks into storage and into bank vaults. Someone even tried to break into a local bank and steal the clock hanging inside. In 1981 a new Ithaca calendar clock company was formed. Trying to reproduce some of the models in small quanties a corporation was formed known as ithaca calendar clock co.,inc. While the ideal sounded simple enough to reproduce some of the clocks, it was soon discovered that the amount of time and money needed to produce a product of that caliber was more than they could afford. From 1981 through the early 90’s there was approximately 500 reproductions made. Today the company is owned by Michael Porter and is located in Newfield, N.Y. The company does repair and refurbishes the old calendar clocks to sell and supplies parts for the same. 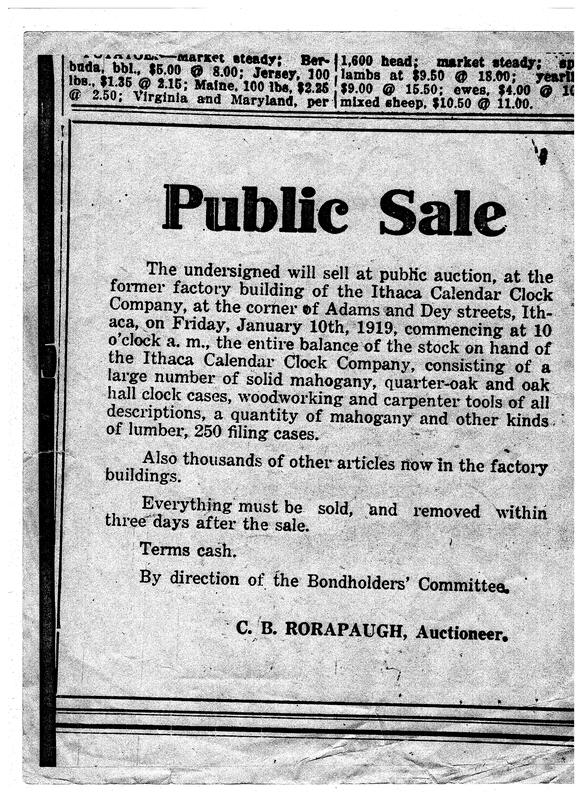 Below is a notice of the auction of the original company.